LYNNETTE LAWAKETE - Zuni Indian, Item2. ITEM YOU SEE IS THE EXACT ITEM YOU WILL RECEIVE. 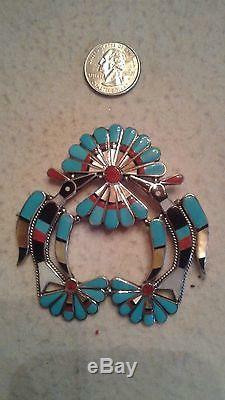 ZUNI Native American Indian PEYOTE BIRD Squash Blossom PENDANT Pin/Brooch combination. Please see photo #2 - you can wear this as a pendant or pin/brooch. Painstakingly all handmade in the very labor-intensive mosaic inlay style of jewelry design by Zuni artist LYNNETTE LAIWAKETE. Please see photo #2 for artist's personal hallmark. Please note: the pawn shop/trading post where I obtained this from put their artist-identifying sticker on this but if you look closely (at my photo) you can clearly see the artist's personal hallmark just below the pawn shop's i. Artist's hallmark reads: STERLING L LAIWAKETE ZUNI. Gigantic, bold, beautiful, unique, unusual. Sterling silver construction (verified and tested). NAJA PENDANT: 3 1/4" x 3 1/8" Yes this is gigantic... This is unclaimed dead pawn. No damage, absolutely PRISTINE, however, the sterling silver is tarnishing. You can polish as your prefer. All stones genuine: Turquoise from the Sleeping Beauty mine in Arizona. Red Coral, Black Jet (jet is fossilized tree material), golden-yellow mother-of-pearl seashell and creamy white mother-of-pearl seashell. The item "Lynnette Laiwakete Peyote Bird Squash Blossom Pendant Pin Necklace Sterling HUGE" is in sale since Friday, April 14, 2017. This item is in the category "Jewelry & Watches\Ethnic, Regional & Tribal\Native American\Necklaces & Pendants". The seller is "rusticmoontradingpost" and is located in Inglewood, California. This item can be shipped to United States.